Where I list what I read and my reactions. traditional mysteries and police procedurals. Bitter hot tea is the perfect companion. I am a long-time fan of the mystery novels of Elizabeth Daly. She wrote 16 books in a series starring Henry Gamadge, an expert in rare books and manuscripts. Over the past few years, I finally found copies of the last three books of hers that I had not read. The Book of the Dead, 8th in the series, was one of them. The story is set in the summer of 1943, and New York City is experiencing a heat wave. In the first chapter we meet a very sick man, Howard Crenshaw, who is being cared for by Pike, a man he met in Vermont when settling his uncle's estate. He has recently found out that his illness is fatal and he will die soon. In the next chapter, a young woman, Idelia Fisher, visits Henry Gamadge and asks if he can help her find out what was once scribbled in the margins of an old edition of some plays of Shakespeare. That edition belonged to Howard Crenshaw; he had brought it with him on his visit to Vermont, and Crenshaw and Idelia had struck up a friendship while he was there. When he left Vermont without saying goodbye to Idelia and she found the book in his house, she wanted to return the book to him. Although she has no real reason to be worried or suspicious about the situation, she wants to know what was erased from the pages of the book. Gamadge is glad to help Idelia and the steps they take lead to him getting involved with a case of murder. He ends up going to Vermont to check out Crenshaw's actions while he was there. This book was published in 1944 and as such shows us some of the culture and life in the US in wartime. The war is not mentioned a lot in the book. Gamadge is doing "war work" and his assistant is off in the Marines. Gas is scarce and cars are not used so much for transportation due to the shortage. Other than that, we just get a very good picture of the times. Women wearing hats; doctors who make home visits. And, since I have mentioned 1944, I will note here that this book is submitted for the 1944 club, hosted by Kaggsy at Kaggsy’s Bookish Ramblings and Simon at Stuck in a Book. Also, for Friday's Forgotten Books at pattinase, Patricia Abbott's blog. As I mentioned above, many years ago I had read 13 of the Henry Gamadge books and I liked them a lot. Coming to more of Daly's books after so many years, I wondered if I would still like the series. I must have read most of the Elizabeth Daly books in the 1970s and 1980s, and at that time the 1940's did not seem so long ago. I think I enjoyed reading about New York and the life of the upper class characters, something I knew nothing about. And in this reading, I still found Gamadge and his investigations good reading. I like the author's writing style and the characters she has created. Gamadge is a very likable person and there are many interesting secondary characters. Gamadge is very prominent in this story; hardly anyone else has a large role, yet he carries the story very well. And he is determined to solve the crime. I was very surprised at the ending of the story, the resolution to the crime and how it was carried out. I think there must have been clues, because I kept feel like something did not make sense to the story, but I never noticed them. I don't mind that kind of story; solving a puzzle myself is not my primary goal when reading mysteries. I can enjoy just following the thread of the story and watching out for red herrings, of which there are plenty here. So, all and all, a very pleasurable reading experience. I have two more books to read (Deadly Nightshade and Murders in Volume 2) before having completed the series, then I will reread the other books. This book has been reprinted by Felony & Mayhem in trade paperback and is available in e-book format. Publisher: Bantam Books, 1948. Orig. pub. 1944. Source: I purchased my copy. Thanks to you, Simon. I am glad you found my post. 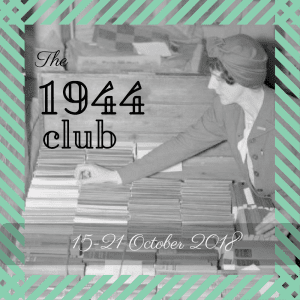 I had had this book for a few years and the 1944 club was my push to finally read it. 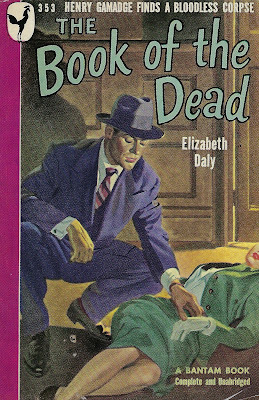 Tracy, I have read about Elizabeth Daly though I haven't read any of her mysteries. Wikipedia describes her as "a New York writer of gentleman-sleuth mysteries in the classic British style" which should be interesting. That is an interesting quote, Prashant. I do like the setting of New York and thereabouts in her books. Elizabeth Daly was one of Agatha Christie's favorite mystery writers, as is noted in some of the posts I linked to. I've not ever read any books by Elizabeth Daly, but I'm fairly certain that the publishers Felony & Mayhem had some of them. I have loved their covers and read some of the books they brought back from going out of print. Love the cover on this one too. 1944 would be a year that my father was in the South Pacific with the Army. My mother was at home and they were engaged, but not married yet. Interesting to think about the time and what life was like. You are right, Kay. I knew that Felony & Mayhem had reprinted this one and a few others, but I checked their site (and Amazon) and they have reprinted all of them. And they do have very nice covers. I am very happy to hear that, because when I was looking for the last two I had not read (this book was one of them), it was very hard to find affordable copies. My father was still in the Army Air Corps in 1944 in the China-Burma-India Theater and had not yet met my mother. She would have been 18 and met my father in 1945, I think. How nostalgic to remember all that. I heard many stories about those days. Read all of them back in the day. I used to read everything by an author when I found them. Now I hop around and often lose track of series. Spoiled for choice, I guess. I'm glad you enjoyed this one, Tracy. I like Elizabeth Daly's writing style, and her Henry Gamadge is an interesting character. And somehow, she makes Gamadge's involvement in cases believable, although that's a bit hard to do with an amateur detective. You are right about Daly making Gamadge's investigations seem natural, inevitable, Margot. Amateur detectives are not my favorites, but that never bothered me with this series. New author to me, and I'm intrigued. I'll have to see if any are easy to find. I hope you do find one of her books to try, Rick. And if you do, that you enjoy it. I'm unfamiliar with Daly's work, Tracy. I'm going to check her out. Thanks for the enticing introduction! Ebook editions are definitely available for these, Matt. I hope you see something you like there. I hope you like it, Matt. Let me know either way once you have read it. Since I have not read any of Daly's books in quite a while (beyond this one), I don't remember any specific stories, Moira. I do remember that he married during the series, and apparently Clara is staying elsewhere during this book. And then later, Daly's niece, Eleanor Boylan, wrote a short series about Clara Gamadge as an amateur sleuth. Haven't tried any of those. This sounds really good. I hadn't heard of Elizabeth Daly before. She is not that well known, Kay, but her books are fairly easy to find in ebook or trade paper which is good. A consultant in antiquarian books is an interesting protagonist and he is a likable character. Tracy, you hit one of my favorite mysteries. I enjoy books that manage to pull the rug out from under me, as this one does (and I suspect, from what you said about being surprised, that you know what I mean). I enjoyed all of Daly's books, but Book of the Dead really stands out. Thanks! Yes, Les, I do know what you mean. And I did see that you rate this book really highly. Probably more you than me, Tracy. I'm glad you enjoyed it. Definitely more my type of book, Col. There was a femme fatale of sorts. I have lived in California for nearly 40 years but grew up in Alabama. I have worked in Information Technology for over 25 years, and currently work in the IT department of an educational institution. I have one each: husband, son, and cat. Share book reviews and ratings with Tracyk, and even join a book club on Goodreads.